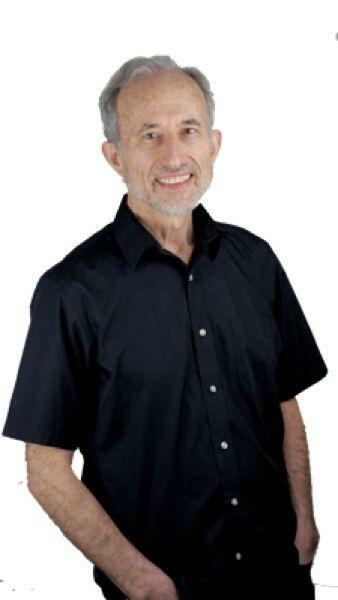 Riverhouse ePress was established by Ron Kraybill in 2006 to publish educational materials in conflict resolution. To date the Style Matters conflict style inventory and related support item remains its central focus. Like the widely-used Thomas Kilmann Conflict Mode Instrument, Style Matters is based on the five-styles Blake Mouton Grid, but Style Matters is distinguished by its cultural flexibility, stress responsiveness, practical focus, moderate pricing, and its user-friendly trainer dashboard supporting easy delivery to users at any scale. Style Matters is available as a print or online version, the latter with a 7-10 page score report tailored to the user’s score and a trainer dashboard for delivery and tracking use. It has been taken by over 100,000 individuals in North America, Canada, the US, Australia, India, and other countries. It is available in English and French, with Spanish underway. Riverhouse is managed day-to-day by Lee Myer, based in Lititz, Pennsylvania, with active support from Kraybill and several freelancers. Riverhouse started as a sideline to my larger mission of educating peacebuilders. In ways I didn’t expect, it has become intertwined with my primary mission. I began my career in 1979 as founding director of Mennonite Conciliation Service, which played a significant role in the early US conflict resolution movement. I spent 1989-95 as Director of Training at the Centre for Conflict Resolution in Capetown and Training Advisor to the National Peace Accord, a large national structure set up by South Africa’s key players to deal with conflict during the political transition. From 1995-2007 I worked with John Paul Lederach, Vern Jantzi, Howard Zehr, and others in establishing the Masters in Conflict Transformation program at Eastern Mennonite University, one of the first Masters in the field. I served as Quaker Representative in the Middle East 2007-2008, and as Senior Advisor on Peacebuilding and Development for the UN in Lesotho and the Philippines 2009-2015. Now at mandatory retirement in the UN, I reside in Silver Spring, Maryland, and continue private consulting and training. Over the last year I’ve spent several large blocks of time in Myanmar training facilitators for regional talks. 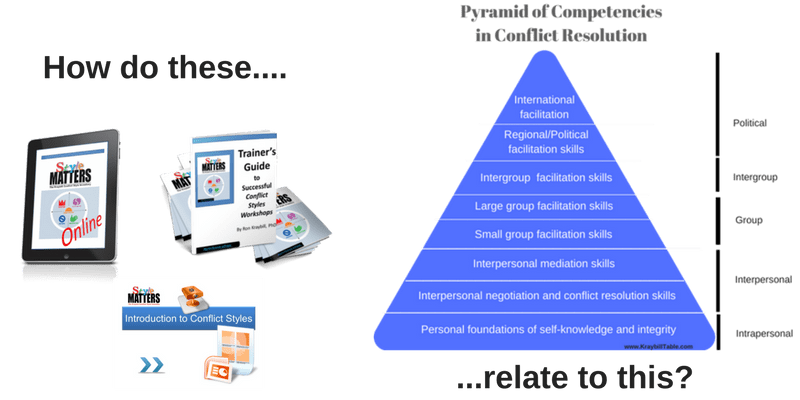 Style Matters emerged as a conflict resolution training tool from my work in the 1980s and 1990s. In setting after setting I had experienced the need for a tool that would take people quickly into key concepts of conflict resolution in a practical way without a lot of lecture. A conflict style inventory does this superbly by giving people a chance to look at their own patterns in conflict. In the process they learn a framework for analyzing conflict and priorities that helps them make conscious choices about things that are often unconscious. I started with the Thomas Kilmann inventory and loved it. But eventually I found it wanting - deaf to cultural issues, blind to the role of stress in conflict styles and its affect as stress rises; optimized more for psychometrics than for learning, skimpy on practical guidance, and too pricey for widespread use. I developed Style Matters in response to those concerns, aided by conversations with trainers around the world and years of experimentation. I saw Style Matters in the beginning as basically a micro-level tool for teaching individuals about interpersonal and team conflict resolution. It's still that, but I now see things I didn't see in the beginning. Much of my work for the past 25 years has been on big processes or with people who are in or expecting to work in big processes. For some years I think I felt that I had moved on to "more important things" in the macro level conflicts I was working and training in. But experience taught me otherwise. One of the most surprising learnings of my career - sometimes quite a shattering one because my work has been directly affected in adverse ways on numerous occasions - is how woefully unprepared are the actors currently mandated to respond to the problems of our world. 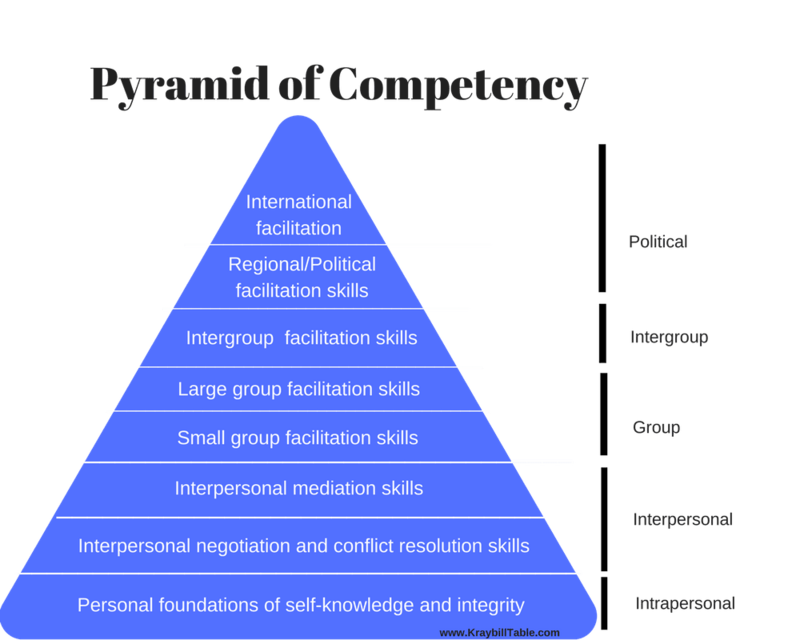 In the Pyramid of Conflict Resolution Competency below I sketch a progression of competencies that practitioners need as they move to higher levels of conflict. Competency at any given level makes it relatively easy to advance upward to the next level. If you’re experienced and skilled at Small Group Facilitation, for example, it’s not a big stretch to move upwards and start doing Large Group Facilitation. By the same token, lack of skill at any given level makes it hard to function well at all levels above it. The truth is that skill at any of those levels is dismayingly rare among the vast majority of leaders of our world today. Leaders of many kinds know how to wield power. They know how to give instructions to others, set forth agendas based on their own interests, mobilize resources to advance them, etc. But few excel at other skills required for effectively leading creative problem-solving. To do that you need a lot more than the ability to compete and exercise power. You also need to be skilled at things like asking good questions, listening well, framing problems constructively, separating needs, positions and interests, etc. To use those skills in group or public settings you also need another whole set of skills like facilitating group dialogue, consensus-building, and decisionmaking, building coalitions, designing and executing collaborative processes, conducting public consultation, etc. Maybe it's unrealistic to expect all those skills in politicians. But the same deficits exist among many designated as professional advisors and peacebuilding consultants in conflict situations. Very few of the people mandated to lead efforts to resolve conflicts that effect millions of people are actually good at the core skills required. Repeatedly I’ve seen promising peace initiatives hit a ceiling and stall, not so much because the issues were impossible but because the “peacemakers” were performing poorly, rarely coordinating well among themselves, frequently dissipating their energy and credibility on needless turf battles among themselves. To put this in reference to the pyramid of competence: The people mandated to be resources at the top levels of the pyramid are paralyzed because they are incompetent at the low levels of the pyramid! This is not acceptable. The problem is not that we don’t know the skills required to function well at each level or how to teach them. It is that we simply do not make it a priority to teach these skills nor do we expect those aspiring to leadership to demonstrate mastery of them. Having spent a career working in progressively higher levels of this pyramid, I now see that the biggest gap among people in leadership in our world is at the lower levels of the pyramid. I retain interest and involvements at the higher levels, but broad progress there will be difficult until institutions and nations place greater priority on building the essential foundations of work at the lower levels. I see Style Matters as one modest contribution to addressing this, helping to build the foundations at the first two levels in the pyramid above by providing a lucid, practical, low-cost tool that can be widely used by all kinds of people.